3.5 stars out of 5 -- "'Planet Earth' and 'Lion of Judah' continue the hard-rock groove, while 'Future Baby Mama' and 'Somewhere Here on Earth' revisit his smooth R&B side." 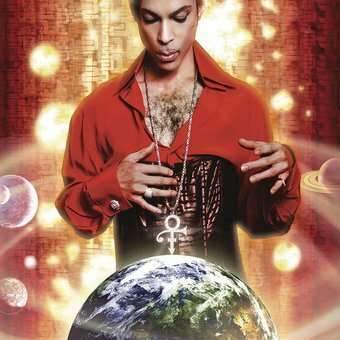 4.5 stars out of 5 -- "PLANET EARTH places him back in six-string superhero territory....These tens songs are focused and playful in ways the recall earlier triumphs..."
"[A] resurgent Prince unleashes his strangest yet most alluring rock project since 1988's astonishing LOVESEXY." 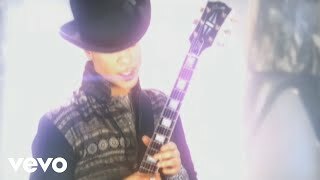 The Purple One's PLANET EARTH arrived amid controversy, as Prince's label refused to release it in the U.K. after he made it a free giveaway with copies of a British newspaper. Despite the unconventional promotional tactics, the album proved to be one of Prince's most straightforward releases in some time. The uptempo pop-rockers "Guitar" and "Resolution" hark back to his mid-'80s heyday, and the slow-jam R&B of "Future Baby Mama" finds him turning up the romantic heat in no uncertain terms. There's no lack of danceability either, as evidenced by the funk workout "Chelsea Rodgers." For all the unfettered energy and libidinous inspiration, though, PLANET EARTH represents a more mature Prince. Pushing 50, he has more on his mind than partying. The elegantly unfurled title track and the aforementioned "Resolution" bespeak a strong sociopolitical awareness, as he addresses the global concerns of climate and war, respectively. Ultimately, the album serves as both a pure slice of sonic pleasure and a potentially consciousness-raising platform for Purple positivity.